← Stopping the Niacin, Was it Blurring My Vision? Just a year of modest aerobic exercise reversed normal brain shrinkage by one to two years in older adults and improved their memory function, according to an article in the Wall Street Journal. Writing in the Journal, Ann Lukits said that a growing body of evidence points to aerobic exercise as a low-cost hedge against neurocognitive decline. “In this study, magnetic resonance imaging was used to measure the effects of aerobic exercise on the hippocampus in 120 Americans in their late 50s to early 80s. Half the group walked three times a week for 40 minutes, aiming for their target heart rate, while the other half did yoga and toning exercises. The hippocampus in walkers increased by 2% after a year and shrank by 1.4% in controls. Both groups showed significant improvements on spatial memory tests conducted before and after the study. This could be due to taking the test repeated times, the researchers said. In the walking group, however, changes in hippocampus volume were directly related to improved memory performance, they said.” Exercise training increases the size of the hippocampus and improves memory. Brain Rules reported that in studies of two elderly populations with differing lifestyles, sedentary vs active, “Cognitive scores were profoundly influenced. Exercise positively affected executive function, spatial tasks, reaction times and quantitative skills. • Exercise increases oxygen flow into the brain, which reduces brain-bound free radicals. One of the most interesting findings of the past few decades is that an increase in oxygen is always accompanied by an uptick in mental sharpness. • Exercise acts directly on the molecular machinery of the brain itself. It increases neurons’ creation, survival, and resistance to damage and stress. So, what are you waiting for? Get going. This is one of my favorite blog items. For a senior citizen like myself with a family history of Alzheimer’s and dementia, it is most welcome. Hope you feel the same. 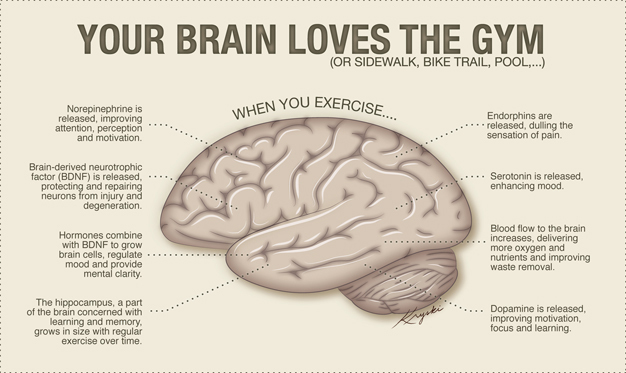 Please check out my Page – Important Facts About Your Brain (and Exercise) for further info on that most important organ. Tony – If you’re taking 5,000mcg daily of sub-lingual B12, and meaningful amounts of quality Ashwaganda and Curcumin, I seriously doubt you’ll EVER have to worry about developing Alzheimer’s. No, I take vitamin supplements, but nothing like what you mentioned. Is that what you take? Thanks. It is one of my favorite posts.